Suitest aims to simplify testing your apps on as many devices as possible at once. You can configure your own devices with Suitest or use the ones made publicly available from other organizations. All the devices which are available to you can be found in a convenient overview from within your account. When using the device interactively you must connect to it. For this, press , select the device from the list and press the connect button. 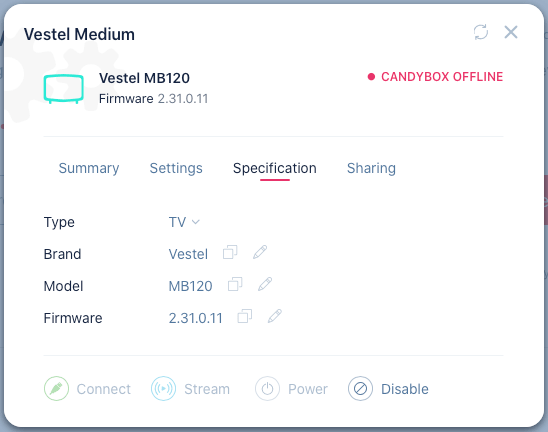 The ability to connect to a device depends on two factors; if the CandyBox is operational and the device status. While a user is connected to the device, Suitest will not launch scheduled tests on it in order not to interrupt the user's work. If somebody schedules a test on a TV that is in use, the led will start flashing . Other users will see this device as IN USE and will not be able to connect to it while someone else is connected. On the devices page, the list of available devices is shown. The device details are displayed and can be filtered by brands, their status and platforms. The list can also be searched through using model name or device name. The list can be filtered using two options, Only mine & shared and Only working. Which limits to the devices available that are functional (this includes IN USE devices) or the devices which are you own or are part of your organization. The devices that you have been given direct access to either from another user or organization will also be shown when filtering by Only mine & shared. Suitest tracks the state of a device and assigns it a status. They are separated into two categories, statuses that you can connect to and that you cannot. READY (Blue) - The device is ready and connected to Suitest. READY (VRC) (Blue) - The device is not tuned to the Suitest channel but is otherwise fine and can be operated in interactive mode. TURNED OFF (Gray) - The device has been turned off by Suitest because it was idle for more than 10 minutes. It will turn on automatically once you connect to it. TESTING (Green) - The device is currently performing a (scheduled) automated test. If connected to, the test will be aborted and rescheduled. POWER ON (Gray) - The device is powering on for an automated test. If connected to, the test will be aborted and rescheduled. IN USE (Yellow) - The device is being used by a user in interactive mode. OFFLINE (Gray) - The device seems to be offline as its IP is unreachable from the CandyBox. DISABLED (Red) - A person with the administrator privileges has disabled the device. Until the device is enabled again, it will not be usable in Suitest. You would want to disable the device to keep the Boogeyman out. CANDYBOX OFFLINE (Red) - The CandyBox responsible for controlling this device is offline or turned off. SUITESTDRIVE TURNED OFF (Red) - Devices using SuitestDrive cannot be connected to as SuitestDrive is not running. BLASTER ERROR (Red) - Device's infrared blaster is disconnected or malfunctioning. Verify that all cables are connected correctly, if you have a spare infrared blaster then replace the malfunctioning blaster. AVAILABLE (Light blue) - Can request access to the device, that is shared publicly. However cannot connect till access granted. Note: Users with administrative privileges can disable devices even when somebody is connected to them. Disabling the device effectively kills the connection but keeps the settings in the same state. These are the statuses that are seen on the screen of your device when you are located on the Suitest channel. Connecting (Gray) - Connection is being established with the device. Ready (Gray) - The device is ready to be added to Suitest. Ready (Green) - The device is ready to be connected to or for a scheduled test. Connected (Green) - User is connected to the device, ready to be controlled. In progress (Recycling Icon) - A scheduled test is in progress on the device. The device you are currently connected has specific colors to quickly indicate the status of your device. Connected (Device name) (Green) - User is connected to the device, ready to be controlled. Connected (Device name) (Flashing Green) - User is connected to the device and a scheduled test is queued. Error (100) (Red) - Internet connection between the device and Suitest is down. Error (102) (Red) - Device is malfunctioning. Caused by browser driver missing, Chrome, Firefox, Vewd TV Emulator installation missing or wrong device IP. To solve this issue disable and enable device in Suitest and if you are still having problems then restart SuitestDrive and/or the host computer. Please let us know if the issues persist. Error (103) (Red) - Internal back-end error. Suitest developers have been notified and are hard at work fixing the issue. Please let us know if the issues persist. Error (105) (Red) - Deleted device. Device was deleted and is no longer usable, add the device via device wizard to use it again. 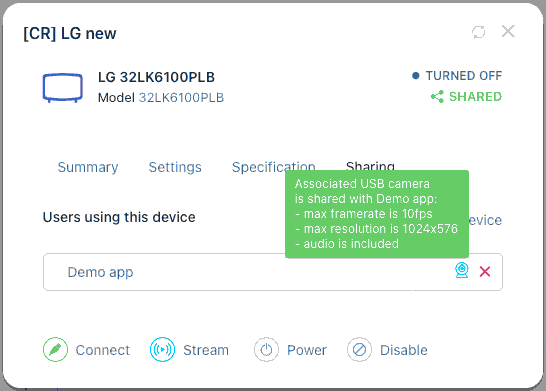 When a device is selected in the connection list, details of the configurations, specifications and sharing & access rights are displayed. The configuration of the devices include the Custom Name, Device Status, Sharing status (Sharing on or off), Platforms, Boot Sequence and inactivity turn off timer. You can change the custom name of the device so that it is recognizable to you (instead of using the brand and model name). The local IP address is also displayed, the local IP of the device can be changed this is in-case there were adjustments in the local network. Important: To prevent connection failures due to the device IP address changes you should consider configuring your DHCP server to assign static IP address to the device. The Suitest Driver, contents depend on what the device is connected. In the case of SuitestDrive, the versions is displayed. In the case of connection through a CandyBox, the CandyBox number and port displayed. Turn off after allows devices to be configured to turn off after a specific amount of inactivity (not connected and no tests running). Default value is 10 minutes. The device specifications includes the Brand, Type, Model and Firmware. The device specification also includes the Device ID which is used for Suitest API. They can be edited via Edit Device Information button to quickly change the specifications (Device ID cannot be changed). Suitest lets you share your device with the rest of the Suitest users and use their shared devices. To share a device go to the Sharing & access rights tab on the device details page and then press Share publicly. Once you do it, this device will be made visible for every Suitest user. Other users will see your device and can request access, they can only see basic information about the device and cannot edit the devices details. The requests can then be approved by the device owner. Device can also be shared within your organization by using the Share with... drop-down. You can approve or reject this sharing request in the same tab. Note: Your device can only be used by another user after you approve the sharing request and such usage will be charged to them and not to you (in terms of minutes). In the devices page you can request access to devices that are not yours or your organizations. Choose the device which you would like access to and view its details, then Request access. The owner of the device will be notified of your request and will either grant access or reject it. Devices can be removed, which means that they are completely removed from Suitest (shared user will lose their access as well). If you wish to use the device in the future then the set-up process will have to be done again. Sometimes you may get a feeling that something is wrong with your TVs. All of a sudden, it starts doing things on its own as if a boogeyman really wanted to get you. Know then that it is just Suitest - diligently trying to do its job. Suitest checks periodically if the device sends in reports. If the connection falls out at some point, Suitest will assume that the device has misbehaved and try to beat it back into shape. "Back into shape" in this instance means making sure that the device has opened Suitest channel and launched the Suitest RedButton app. So if you, for example, switch to another channel or open an app without a Suitest code, you'll kill the connection between the device and Suitest will try to repair it by executing a so-called boot sequence. Important: You can tell Suitest to stay out of your way by disabling the device. For this, open the device properties page and click on the Disable button.